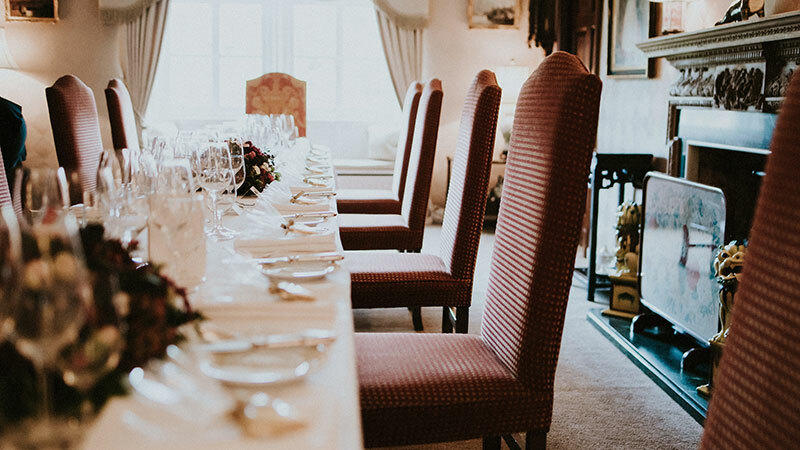 The Festive time has come around again and after such a busy year with all of our gorgeous couples, we’re looking towards some of our favourite things about Christmas. Whilst you’re relaxing at home and getting the aprons out with the family, we’ve put together some of the teams favourite family recipe’s. From all of us here at Box Tree Events, we’re wishing you an amazing Christmas Celebration and we look forward to seeing you in 2018! 500g Brussels sprouts, trimmed, 140g diced pancetta, 200g cooked chestnuts, broken into large pieces, 1 tbsp light muscovado sugar, 200ml vegetable stock. Boil the sprouts for 3 mins until starting to soften slightly, then drain. Fry the pancetta until crisp, then remove from the pan and set aside. Add the chestnuts and sugar, tossing in the pan, then add the stock and reduce by half. 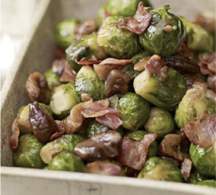 Add the sprouts and pancetta back to the pan and warm through to serve. Not sure what to do with left overs?? 2 lbs beef or turkey white or dark, 1 cup frozen peas, 1 1/2 cups pickles chopped, 2 lbs potatoes peeled, 1 lb carrots peeled, 1/2 to 1 cup mayonnaise, 1/4 cup mustard salt and pepper to taste. Boil the beef for about 3 hours, or use a pressure cooker to finish faster. It needs to be very tender. If using turkey or chicken, boil the meat until cooked through, probably takes about 45 min to 1 hour for turkey breast, depends on the size of your breast. Take the meat out and let it cool before chopping. Boil the potatoes and carrots. Let everything cool and start dicing everything. Dice the meat, potatoes and carrots, they should all be small pieces about 1/2 cm by 1/2 cm. Make sure you drain all the juice from the diced pickles and peas. Add all the veggies and meat to a big bowl, then add mayo and mustard, season with salt and pepper and mix everything together. 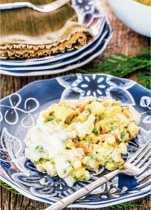 You will end up with a big bowl of salad, traditionally we smooth out the top of the salad with a knife and spread more mayonnaise and smooth that out. Cover with plastic wrap and you can refrigerate it for days up to a week. Serve salad cold, do not warm it up. 175g dark muscovado sugar, 85g golden syrup, 100g butter, 350g plain flour, plus extra for dusting, 1 tsp bicarbonate of soda, 1 tbsp ground ginger, 1 tsp ground cinnamon, 1 egg, beaten. To decorate: ready-made writing icing, chocolate buttons or small sweets (optional). Melt the sugar, golden syrup and butter in a saucepan, then bubble for 1-2 mins. Leave to cool for about 10 mins. Tip the flour, bicarbonate of soda and spices into a large bowl. Add the warm syrup mixture and the egg, stir everything together, then gently knead in the bowl until smooth and streak-free. The dough will firm up once cooled. Wrap in cling film and chill for at least 30 mins. Remove the dough from the fridge, leave at room temperature until softened. Heat oven to 200C/180C fan/gas 6 and line two baking trays with baking parchment. Roll out the dough to the thickness of a £1 coin, then cut out gingerbread people with a cutter. Re-roll the excess dough and keep cutting until it’s all used up. Lift the biscuits onto the trays and bake for 10-12 mins, swapping the trays over halfway through cooking. Leave to cool on the trays for 5 mins, then transfer to a wire rack to cool completely. Use the icing to decorate the biscuits as you wish, and stick on sweets for buttons. Leave to dry for 1-2 hrs. Will keep for up to three days in an airtight container. 100g mixed dried fruit with peel, 180ml apple juice, 7g dried yeast, 250g plain flour, plus a little extra for dusting, 30g blanched whole almonds, generous pinch of ground cinnamon, generous pinch of ground aniseed or allspice, small pinch of ground cloves, 75g cold marzipan, cut into small pieces, 10g butter, melted, 1 tbsp icing sugar. Soak the dried fruit in 100ml of hot water. Gently warm the apple juice for a few mins in a pan, then add the yeast and leave to activate for 10-15 mins (it will start to bubble). Put the flour in a bowl. Stir in the yeast and apple juice mixture to form a smooth dough, then cover and leave to prove somewhere warm until roughly doubled in size, about 1-2 hrs. You can also put the dough in the fridge to rise slowly overnight. Drain the fruit and add to the dough along with the nuts, spices and marzipan. Squish everything together, then turn the dough out onto a lightly floured work surface and knead until the fruit stays in the dough. Shape the dough into a sausage shape and put it on a baking tray lined with baking parchment. Cover with a clean tea towel and leave to prove somewhere warm for 30 mins–1 hr until it has risen by about a quarter. Heat oven to 180C/160C fan/gas 4. Bake the stollen for 20 mins, then reduce oven to 150C/130C fan/gas 2 and bake for 25-30 mins more until golden brown and firm to the touch. 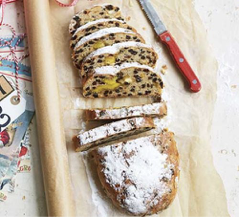 Remove the stollen from the oven and brush all over with the melted butter. Dust with the icing sugar and leave to cool completely before slicing. Store any remaining stollen, well wrapped, in an airtight container.